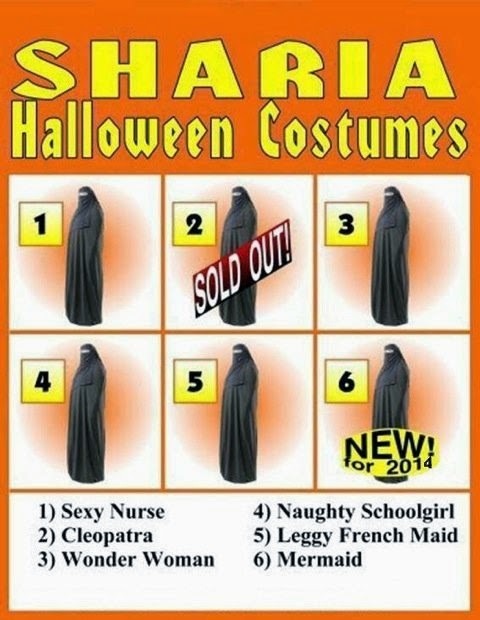 MyRightWingDad.net: FWD: Halloween costumes selling out. Subject: Halloween costumes selling out. This entry was posted on 10/16/2014 08:37:00 AM and is filed under MAKING FUN OF MINORITIES SURE IS FUN , MUSLIM . You can follow any responses to this entry through the RSS 2.0 feed. You can leave a response, or trackback from your own site. Damn, the "Cleopatra" costume has sold-out! Guess the burka-clad Taliban women are totally screwed this Halloween....no candy for those female camel-jockeys. They can always dress up as Obummer, I guess. Let me guess. All you liberal assholes on here are gonna get dressed up as LIBERAL WEENIES for Halloween and steal all the other children's candy...because you are too lazy to go out trick-or-treating for yourselves. We know the m.o. of all you lazy government services consuming Liberal assholes. Y'all even rely on the government to wipe your assholes for you! Actually, liberals believe in supporting essential government services via taxation. It's how we pay for things, and we don't mind working to pay taxes that contributed to such things as roads, schools and defense. It's Republicans who think that taxes should be zero and all government services should be free. Trolls are a lonely breed.